Depression is the largest contributor to global disease burden (World Health Organization), costing approximately $150 billion per year in Europe. Subthreshold depression, a condition characterized by impairments and reduced quality of life, almost doubles these costs, bringing them to a staggering quarter of a trillion dollars annually. Given the exceptionally high financial burden associated with clinical and subclinical depression, improving the preventative measures, as well as the efficacy and delivery of the interventions is imperative. In the recent years, automated CBT (interventions delivered on the computer, or online, which use no or minimal therapist support) has emerged as a solution that can, on some dimensions, be as effective as the classical CBT. However, the existing computerized interventions for depression also come with less desirable outcomes, such as high dropout rates (50%-60%), limited endurance of long-term benefits, or limited improvement in functioning. We have addressed these limitations by creating a computerized solution for therapists and their patients aiming at reducing depressive symptomatology, or increasing well-being. The solution consists of a mobile app for iOS and Android, along with a therapist interface. 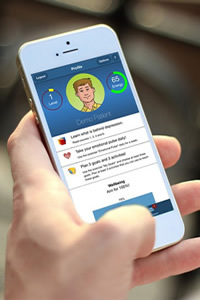 The app presents materials and interactive, science-based depression-reducing exercises that react and adapt to users’ preferences. The apps are available for iOS (English and Romanian) and Android (English and Romanian). A mobile app for depression treatment.